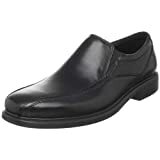 If you work as a retail worker, nurse, teacher, cashier or do other type of work that requires standing all day you know how important it is to have comfortable shoes. Shoes for work should fit well, support foot arches and heels, not too much or little cushion, and look nice. 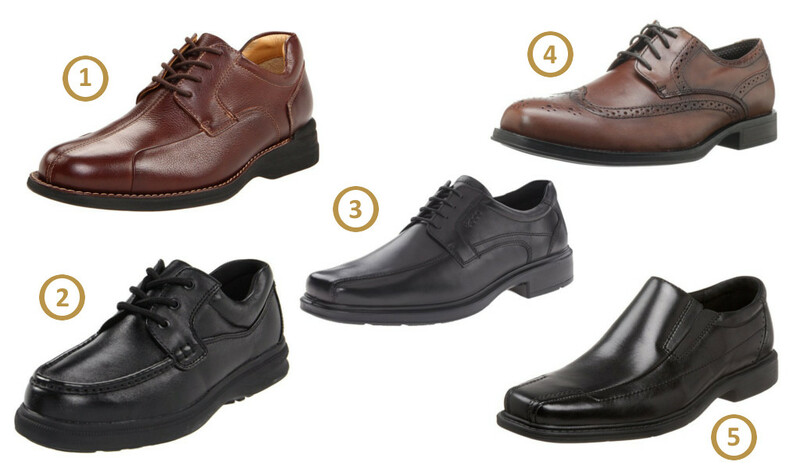 In this post we will take a look at some of the best shoes for men who work inside and stand or walk all day. 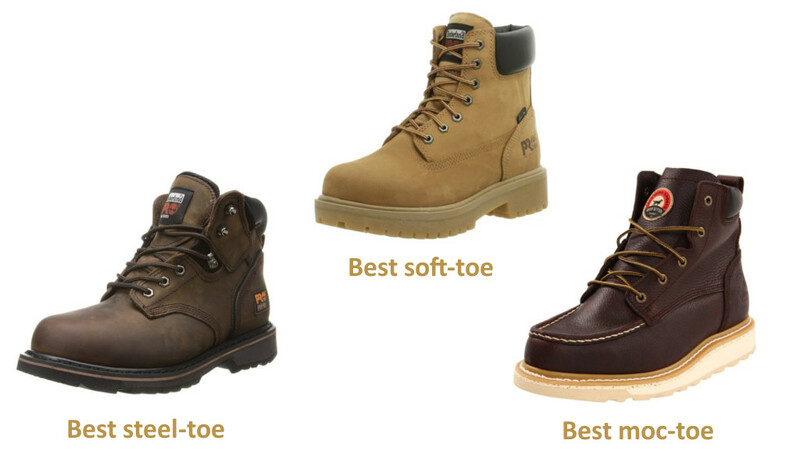 We have considered only the best footwear for work based on the reviews of thousands of people. Work shoes doesn’t have to look like crocs in order to be comfortable. 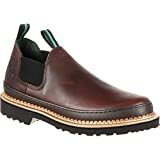 We found several shoes that are dressy enough to be worn as casual business wear and very comfortable on the foot: Bostonian Slip-On and Dr. Martens loafer. These shoes are simple, elegant and well made and have an undercover athletic fit. These two examples are the best dress shoes for retail work that we could find. Even evil car salesmen wear Bostonian shoes! Lightweight comfortable shoes may not have quality rubber soles. Rubber is a heavy material and suits more for boots and other solid footwear. 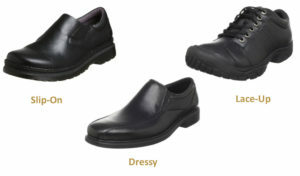 Work shoes must not weight a lot, as your feet will get tired of having to carry the weight of the shoes the whole day. Synthetic material is a good lightweight alternative to the rubber soles. They may provide good cushioning and support. Backside of synthetic soles is that they are rather slippery. If your work environment includes working on wet ground like floors or wet pavement try avoiding shoes with synthetic soles as they have bad traction. 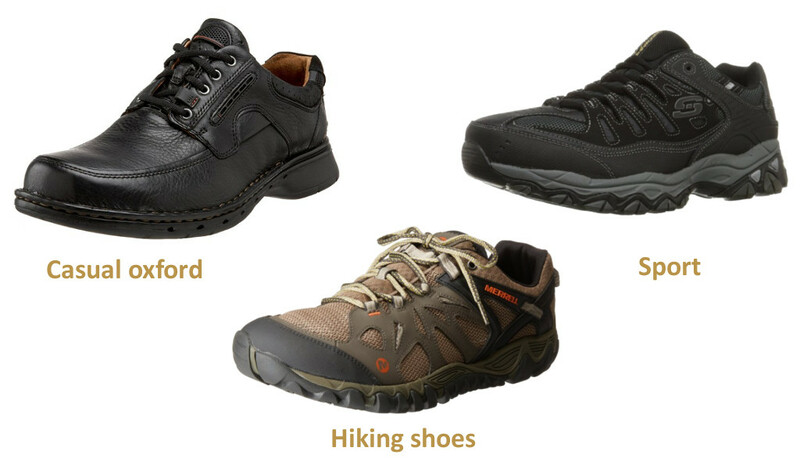 The best slip-resistant shoes for standing all day are: KEEN Utility PTC Oxford Work Shoe and Merrell Jungle Moc Pro Grip Work Shoe. Many professions require kneeling and flexing in shoes, while walking during the day such restaurant workers do. 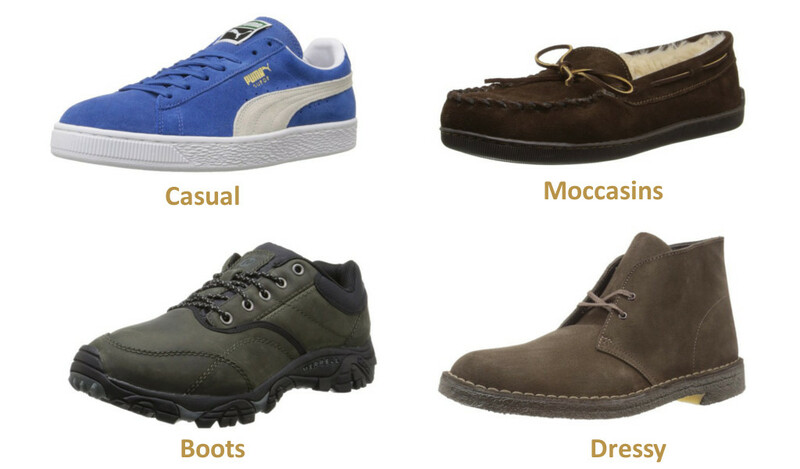 For active types of work chose shoes with real leather upper. 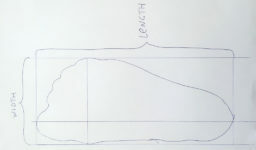 Synthetic upper materials may separate at flex points during wear. Leather material is strong and can be cleaned more easily. 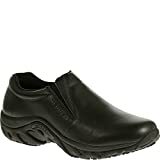 The very best male shoe for work with narrow to normal wide foot according to our research is Merrell Men’s Jungle Moc Pro Grip Slip-Resistant Work Shoe. 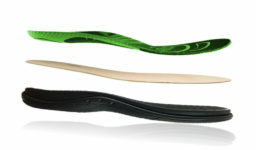 The shoe has rubber sole that makes it extremely slip-resistant. 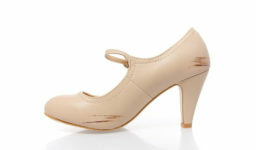 It is made of durable leather upper and doesn’t crack when you flex your foot a lot. It is also lightweight and supportive. Reviewers who work in health care and work 12+ hours a day are very satisfied. The best work shoes for wide feet are Bostonian Bolton Dress Slip-On, Skechers Rockland Lace-Up Shoe and Skechers Flex Advantage Slip On. These shoes offer up to 3E wide sizes.